BAGUIO CITY — Over 300 supporters of Chief Justice Ma. Lourdes Sereno led by the Coaliton for Justice and Movement Against Tyranny (MAT) marched to the Supreme Court (SC) summer court house chanting “quo warranto, ibasura”, CJ Sereno ipaglaban” and “defend democracy” past 10:00AM on April 10. Police barricaded the road leading to the SC court house preventing the groups to hold a picket here. The SC held oral arguments regarding a quo warranto petition filed against Sereno by Solicitor General Jose Calida at around 2:00PM until past 7:00PM. The groups picketed right where they were blocked by police officers. It can be recalled that CFJ and MAT also picketed the Court last week at the start of this year’s summer sessions. The picketers first assembled at Sunshine Park about 25 meters from the court house, but they marched around downtown Baguio first before proceeding to the SC compound. Darby Santiago, a physician said he joined the picket because the SC is the refuge of people against injustice. He shared the story of Sarah Alvarez, a health worker who became a human rights defender after witnessing the injustices that people suffer in the countryside. Alvarez was arrested after she was charged with trumped up cases and then included in the recent terror list of the Department of Justice (DOJ). Santiago said the attack against the chief justice is among the steps the present administration is taking to take complete control of the judiciary. He said that the high court is the last resort af people like Alvarez in the judicial system. Santiago urged everyone to defend judicial independence. “Huwag nating hayaang ang ating korte ay balahurain ng administrasyon ito,” he said. Teddy Casino of MAT said that human rights, civil liberties and democracy itself is at stake in the SC’s decision on the quo warranto petition. He reiterated that the justices, of all the branches of government is primarily tasked to uphold the rule of law. “If the justices choose not to junk the quo warranto petition then the people should junk them,” Casino said. 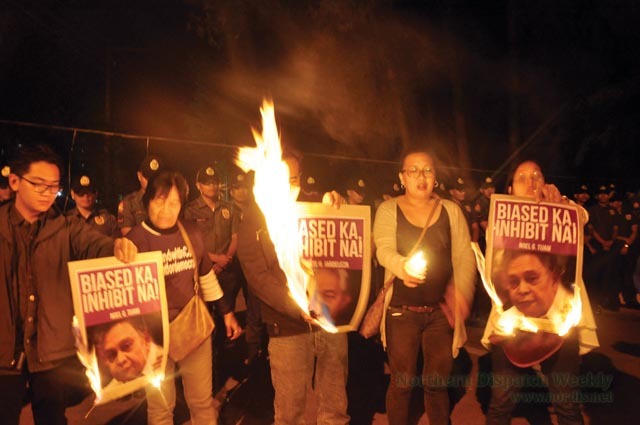 At around 7:00PM the groups burned posters bearing the photographs of five justices who testified against her in Congress right after a prayer vigil and candle lighting. Members of the Coalition for Justice waited for Sereno who attended oral arguments at the SC summer courthouse to determine whether the court would accept a quo warranto petition filed to oust the SC leader.